Taserface is a villain of the Guardians of the Galaxy. Taserface will in Guardians of the Galaxy Volume 2 and played by actor Chris Sullivan. In an alternate future (31st century) reality of the Marvel universe a whole planet of aliens have based their entire race and culture off of Iron Technology. The race calls themselves the Stark after their spiritual founder. Their greatest warrior / scout is known as Taserface. Many years before this a group called the Martian Masters was preparing to conquer Earth. Tony Stark launched all of his technology out into space on a rocket where it landed on a primitive world. A primitive race finds the rockets and slowly overtime comes to understand its technology. The gift of Stark technology allows them to blast forward. They begin to create cybernetic suits like the Iron Man suit and call themselves the Stark. The aliens erect a massive statue and worship Tony Stark. The world is heavily polluted by their industry and eventually it is unable to support life. The Stark then leave to find new worlds to conquer. Taserface is the best scout for the Stark he searches for new planets to take take over. While scouting a planet named Courg he runs into the Guardians of the Galaxy while scouting the planet. He battles the group and is beaten badly. Vance Astro manages to break open Taserface's suit revealing his old body to the outside world for the time in a millennium. 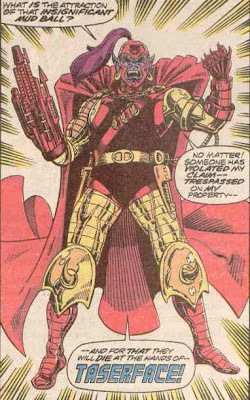 For a time Taserface is renamed the "Nameless" for his disgraceful performance in battle. The Guardians then slay another Stark named Lt Darkeyes. Taserface is enhanced and sent out to defeat the Guardians and destroy their ship, the Freedom Lady. This time an upgraded Taserface fairs better but Starhawk calls for reinforcements and he is still defeated when Firelord rejoins the Guardians of the Galaxy. Taserface has an advanced cyborg body that is based off the Iron Man suit and includes genetic alteration enhancements. Well for Guardians of the Galaxy Vol 2 James Gunn must have decided there was a fun way to bring Taserface into film because he has been announced to appear in the 2nd film. He will be played by Chris Sullivan. Chris Sullivan is most well known for his burly portrayal of ambulance driver Tom Cleary on the Nick. One thing I really like about Chris is his old school gruff voice he uses on the Nick so look for Taserface to get a few interesting lines. My guess is that Taserface will not be the 31st century version of the character that is based off of Iron Man technology. I think he will either be a ravager or a bounty hunter like Boba Fett.